Leonard H. McCoy (nicknamed "Bones"). was played by Deforest Kelley, it was the Doctor character in the original Star Trek seires, and the first six Star Trek films. The character does not appear in the two pilots for the series, "The Cage" and "Where No Man Has Gone Before"; the ship's doctors in those episodes were Philip Boyce (John Hoyt) and Mark Piper (Paul Fix), respectively. Karl Urban played a young Leonard McCoy in a later Star Trek film that was directed by J.J. Abrams. DeForest Kelley was born January 20, 1920 and he died June 11, 1999. Leonard McCoy was born in 2227 according to Star Trek. The Next Generation episond: "Encounter at Farpoint". He attended the University of Mississippi, where he once met Emony Dax, a female Trill athlete with whom it was implied he had a "brief involvement" (Star Trek: Deep Space Nine episode: "Trials and Tribble-ations". By 2265, McCoy had been promoted to lieutenant commander and was assigned as a medical observer to the planet Capella. The assignment was unfruitful, as the Capellians found little need for medical arts and existed under a tribal society where only the strong survived ("Friday's Child"). He is suspicious of advanced technology, especially the transporter, which he regards with distrust and outright dismay (often expressing a suspicion that the device will irretrievably scatter his atoms), and occassionally is bigoted with regards to Spock's half-Vulcan ancestry. A divorc'e, he often showed a flirtious side to female members of the Enterprise crew. He is the only American Southerner depicted among the racially and ethnically diverse crew of the USS Enterprise. McCoy is a physician of considerable skill, capable of successfully treating creatures whose physiologies he is unfamiliar with, such as the Horta ("The Devil in the Dark"), though he often hesitates at operationg on Vulcans due to his relative unfamiliarity with their anatomy and has no practical knowledge of Klingon anatomy. As a doctor, McCoy preferes old-fashioned, personalization or less-intrusive remedies to cutting-edge treatments and computerized medicine, once complaining that the refit Enterprise's sick bay was more a computer center than a medical office. He also is a great believer in the body's own recuperative powers, though he also realizes that medicine as it exists in the 23rd Century has to help along the process. In 2266, McCoy was posted as chief medical officer of the USS Enterprise under Captain James T. Kirk, replacing Doctor Mark Piper. McCoy and Kirk became good friends, but the passionate, sometimes cantankerous McCoy frequently argued with Kirk's other close friend and confidant Spock. In 2268, he was diagnosed iwth Xenopolycythemia, a normally incurable and fatal boold disease. After an encounter with the Fabrai civilization, travelling inside the astroid colony ship Yonada, McCoy was able to discover a cure for the disease. He served aboard Enterprise until 2270, when the ship's five-year mission was completed. He resigned his commission or was placed on inactive reserve. 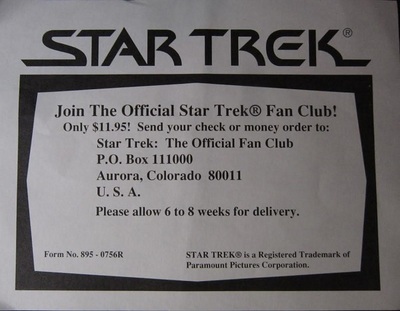 During 2271 V'Ger Crisis, Admiral Kirk requested McCoy specifically as a member of Enterprise's crew for the investication of the V'Ger entitiy. At Kirk's request, Nogura employed what McCoy described as a "little-known, seldom-used reserve activation clause", which McCoy likened to being drafted, to reactivate McCoy's commision as a commander and chief medical officer. Ertl was a company based in Dyresville, Iowa. They started out initially making die cast metal farm toys: tractors, combines, plows etc., and later broke into plastic toys and model kits. Some of their kits were origianally Esci molds a company based in Italy. They moved their metal toy manufactureing to China and the plastics to Mexico. Then the plastic model kits stopped. The company is now owned by another toy company. AMT was associated with them at one time and I think they were just a distributor. The kit comes in a blousy shrink-wrapped end opening type box that half it's length is a void. I am no fan of this type of box, because invariabley parts or the decal sheet find their way past one of the end flaps to become lost forever. Give me a tray and lid type box any day of the week. 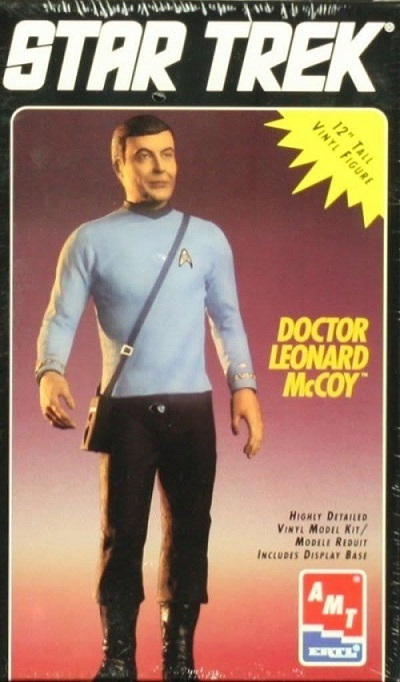 The box art shows the McCoy figure made up. He is a standing figure. He wears a blue shirt, black pants bloused into black boots. He carries a tri-corder slung over one shoulder. He has a fleet insignia on his chest and gold stripes on his cuffs. One side panel says the kit is a Special Collector's Edition Series and has a close up color photo of the figures face. The other side panel has a Commitment to Quality statement and a guarantee with a 1-800 phone number to call with any problems with the kit. 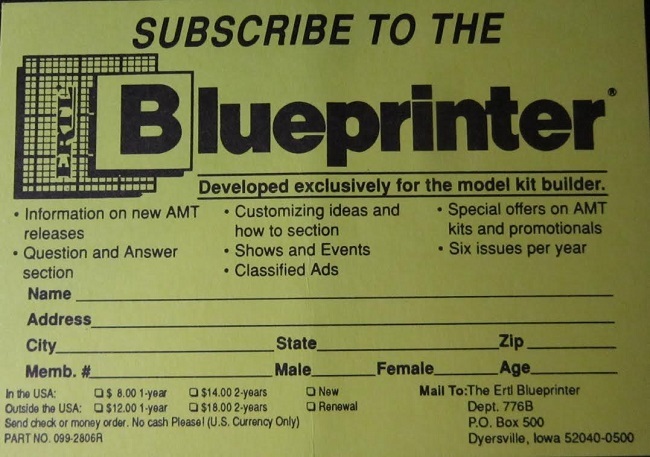 This is followed by mention of Ertl being located in Dyresville, IA, that the kit was made in China and packaged in the US. The kit is not suitable for children under 8, because of small parts. This is said in multiple languages includeing English. 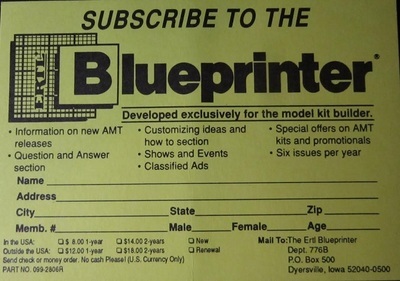 This kit contains 7 light grey vinyl parts, a black circular display stand that is hard plastic, a black vinyl tri-corder with straps, the instructions, a Blueprinter magazine subscription card at $4.00 per year to subscribe (there are 2 of these in the kit) and a Star Trek Fan Club subscription card that costs $11.95 to join. 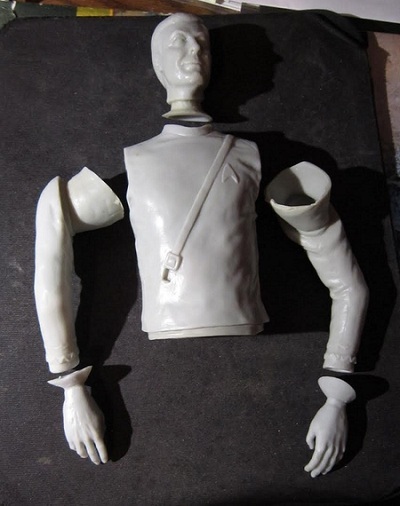 ​The figure is broken down into seperate head, torso, lower body half, arms and hands. The tri-corder and display base complete the parts. Parts are in 3 sealed cello bags. 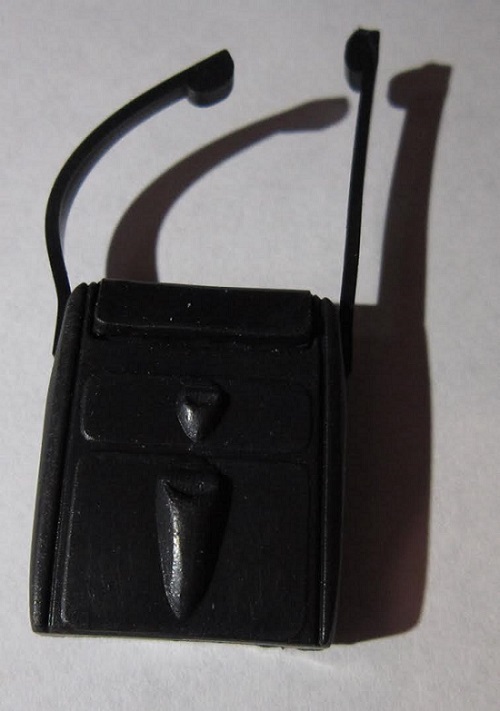 The base in a bag, the tri-corder in a small bag and the figure parts in a bag. The base for the figure. ​The instructions consist of a single sheet that accordion-folds out into 6 pages in 7 1/2" x 8 1/2" page format. Page one has a black and white repeat of the box art and the head shot on the side panel. The kit is licensed by Paramount Pictures in 1994. Page two begins with Assembly instructions, followed by a list of recommended tools. Page three has the painting instructions. 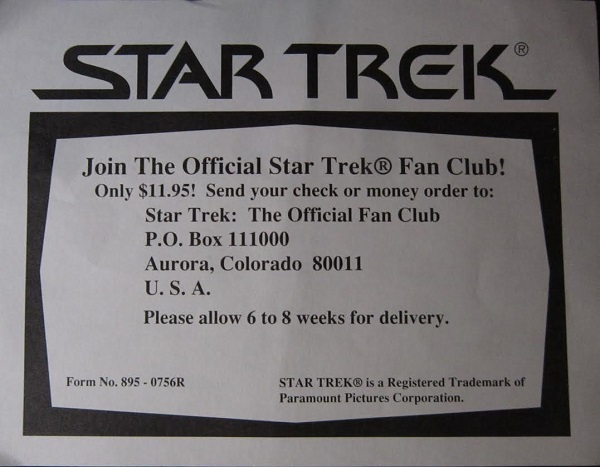 Page four lists 2 other Star Trek vinyl figures marketed by AMT-Ertl: kit no. 8773DO Capt. James T. Kirk and kit no. 8777DO Lt. Commander Scott. This is followed by the 1-800 number again to call with any problems with the kit and Ertl's P.O. address in Dyresville. Page 5 is Parts Preperation instructions. Some extra vinyl must be removed from the parts and heating those areas first before cutting them off will soften the vinyl and make things easier. Page 6 is the final assembly instructions and painting the Star Fleet insignia on McCoy's chest. 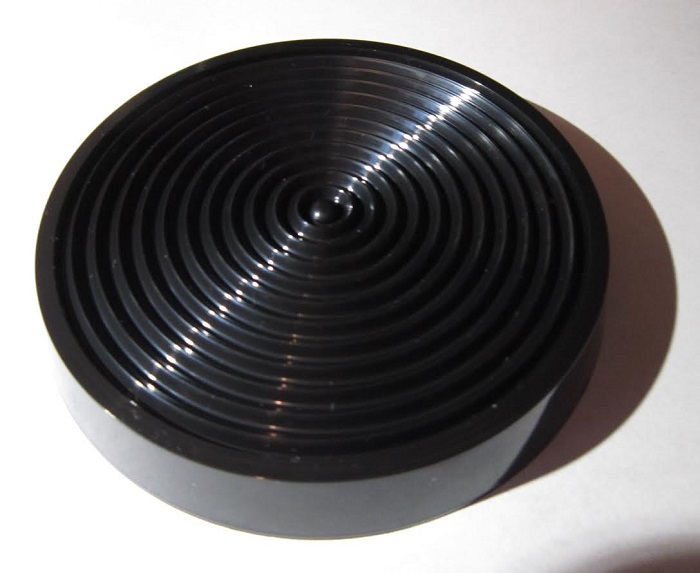 The circlular display base is called out to be painted 2 shades of silver; flat and bright. 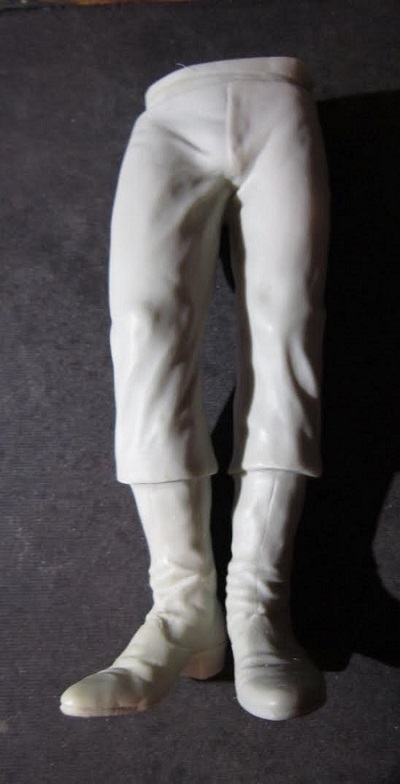 I have heard it comented that the Star Trek figures seem to have no hips. I have to agree a little with this. McCoy does look a little straight up and down. I purchased my kit at the Ertly factory discount store years ago.